Are you tired of muddy and sloppy bass in your room with bass notes masking your music into one big bloated mess? Need a cost effective way of dealing with the problem? 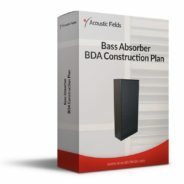 Then you should build your own DIY Bass Absorbers following our easy to follow plans! 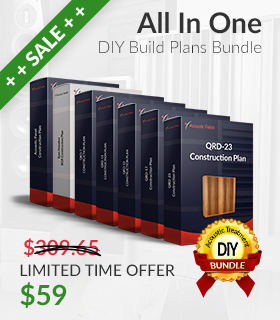 DIY plans that are based on our $1,000+ production units! A bass absorber that deals with bass energy all the way down to 30 Hz! Are you tired of homogenous, ugly looking foam stuck up on your walls? Need a cost effective way of dealing with the problem? 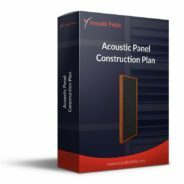 Then our DIY Acoustic Panels are ideal for you! DIY plans that are based on our $350+ production units! Windows are always an issue when it comes to music presentation or recording. There is nothing worse than the harsh, brittle, glare that comes from sound energy reflecting off of glass. Unfortunately it is a necessary evil in today’s rooms especially rooms that are used for music and living at the same time. Windows need to be uncovered so light and viewing can occur, along with an option to cover them when music is played or recorded. There are two methods that you can use to deal with the harsh glass sound. You can use diffusion or absorption. 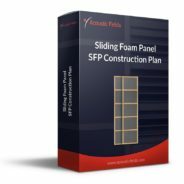 The SFP or sliding foam panel is a way to use absorption to cover the glass and have sound energy strike sound absorbing foam instead of the glass. A wood frame with our foam technology inserted within the frame produces a “ladder” look and appearance that slides back and forth on a track assembly. The “ladder” assembly can be made to any height that works with out standard foam sizes of 18″ x 25″ . You can have 2 sections, three, or even four to work with larger sliding glass patio doors or any other window size that compliments these measurement guidelines. Foam is grey and the “ladder” or frame assembly is available in different wood options.The track installation is straight forward and easy to install. Adjustments in the track assembly are easy to use and can assist you with fine tuning how easily they move and slide into place.